Western Kingbirds are pretty dang cool birds. This Spring, I've had a couple of pairs hanging around my office parking lot. It's been fun to watch them hunt bugs on the wing and to hear their noisy scolding. The yellow color on the belly is striking. These photos show the brownness of the wings and the contrast of the throat to the head. It seems that Tyrannus flycatchers have many common traits with those Myiarchus flycatchers. Check out those rictal bristles! Yeah...when I'm shaving I sometimes miss those whiskers near my nostrils too. As noted in the name, Western Kingbirds are primarily found in the western half of North America with their strongest presence in the great plains region. Looks like they winter in Central America and have a strong pattern of vagrancy in the east. Western Kingbirds are apparently good recyclers. Below, a pair of Western Kingbirds has repurposed an American Robin nest in a tree in my office parking lot. You can see the new layer of mud and then new twigs. I observed them defending the tree and nest site for a week or so and brooding (sitting on the eggs) just recently began. Incubation only lasts a couple of weeks and chicks only remain in the nest a couple of weeks, so I'm looking forward to watching this nest for the next month. About a quarter mile away, up my favorite birding canyon at my patch, another pair of Western Kingbirds has a nest. This nest consists of a significant amount of plastic strands, probably gleaned from the nearby construction sites. One of the Western Flycatchers I've been watching has this yellow substance near one nostril. I'm not sure what it is. Bird booger? a Fungus? a cluster of pollen? Any ideas? Images digiscoped with a Swarovski ATX 85mm spotting scope and handheld iPhone 4s. Prachtig hé, ik ben ook dol op vogels, maar zo kleurrijk zoals bij jou zie ik ze hier niet. maar ik blijf alert met mijn fototoestel in de buurt. Great images, Robert! Congrats! Didn't know you spoke Dutch? 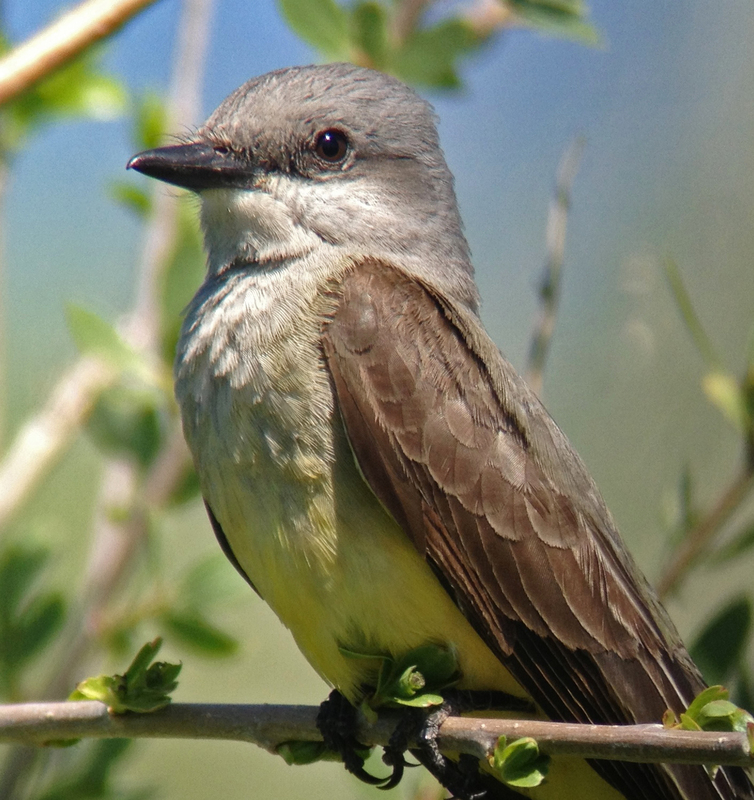 Awesome images of the Western Kingbird! 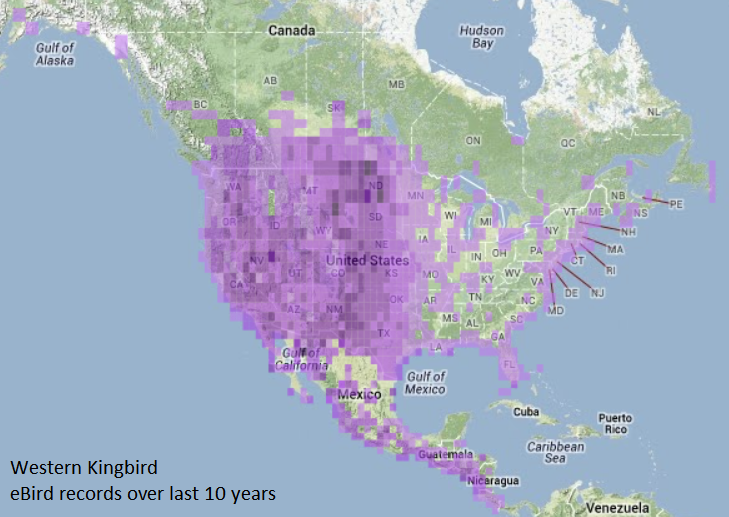 I have only had the pleasure of observing Eastern Kingbirds in my neck of the woods. It will be fun for you to watch the nestlings grow.